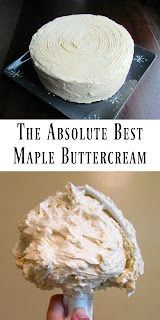 This Maple Buttercream is the best ever! It's not too sweet and has just enough maple. It is cream, smooth and buttery in the best kind of way. You have to try it! 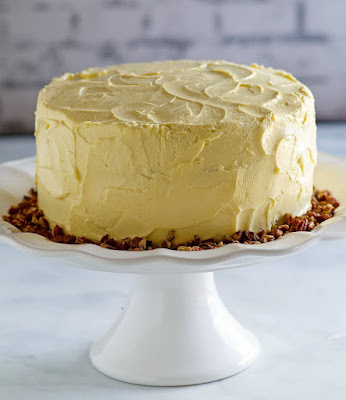 This maple buttercream is rich, smooth and delicious. 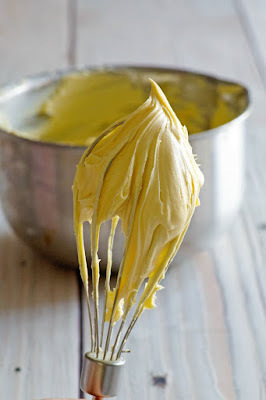 It is made in the French style of buttercream, with egg yolks which make it extra silky and sumptuous. 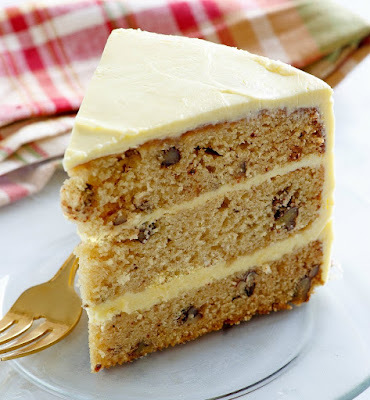 You are going to want to put it on all of the things, but I suggest you start with maple pecan layer cake! I would tell you that you should go ahead and make a batch for practice, but this seems like it needs something extra special to go with. So go ahead and give it a try if you want, but prepare to be hooked. Most of my buttercream recipes are made with powdered sugar. This one is made with sugar syrup instead, which makes is super smooth. The egg yolks make it extra rich and unctuous. I cannot wait to play with this base more and make other yummy variations... but the maple syrup was sooooooooo good in this. I cannot tell you enough how much I liked it. This frosting and it's super yummy cake companion was a perfect birthday cake for my Uncle Steve. It would also be a great Thanksgiving alternative to pumpkin pie, so I will be sure to show you the rest before the big turkey day! 1. 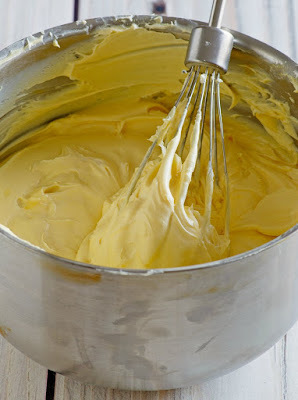 First the prep: Place egg yolk in your mixer bowl and set aside.2. Cut cold butter into cubes so you'll be ready when it's time.3. Time to get started: In a saucepan, mix together sugar and water. Bring to a boil. When it reaches about 240 F, start beating the egg yolks. They should become pale as they are beaten.4. Meanwhile, keep an eye on the sugar. When it reaches 248 F, remove the sugar syrup from the heat. With the beater running on low, slowly drizzle the hot sugar syrup into the egg yolks. (Remember, that syrup is super hot so go slow and be careful.) Once the syrup is completely added, continue to beat until it is almost back to room temperature.5. Add the butter a cube or two at a time until it is completely mixed in. 6. Scrape down the sides of the bowl and add the maple syrup and vanilla. 7. Beat a little longer and then frost the cake right away.8. 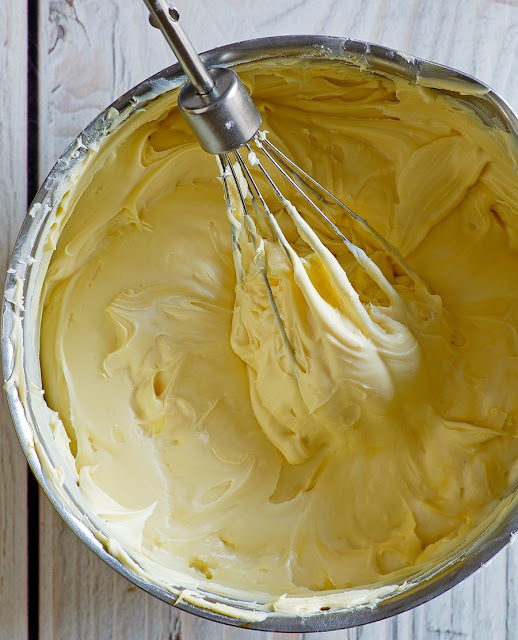 If you have to store some frosting and use later, store in an airtight container in the refrigerator. Allow it to come to room temperature and beat until fluffy again before using. Ahhh, and just like that, I'm in frosting heaven!!! It is so smooth and creamy and yummy!! I have had frostings like this, but had never made one myself. It might be my new go-to buttercream technique! This looks so yummy! I love frosting and sometimes have a hard time keeping myself from eating the frosting before I frost the cake. Thanks for joining the Family Joy Link Party! Frosting is one of my absolute favorite things, so I completely understand! I hope you give this one a try. YUM! I always find so many things to pin when I visit your site :) Love maple and I'll def. try this out. As soon as I saw you had a frosting recipe, I new I would be drooling and craving something new! Really sounds delicious, Carlee! 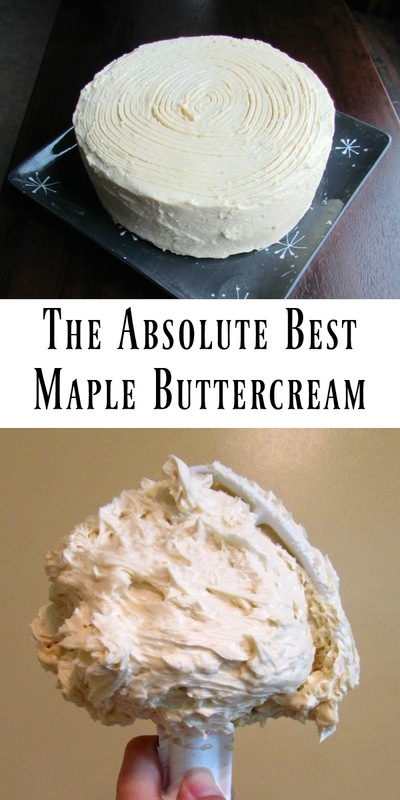 I've never heard of a maple butter cream. My grandmother used to make homemade maple ice cream and it was a favorite of everyone in the family. It brings back great memories, as we used to make maple ice cream on Christmas Eve. We would take turns on the hand crank in the basement while the women got dinner ready in the kitchen. This buttercream sounds like it would be similar. I am a huge fan of frosting and I can see myself eating this with a spoon. Yum. What a fun memory and a great tradition! This one is a winner for sure, Nikki. I hope you give it a try! Oh, yum! This looks and sounds amazing! Pinned and Sharing! Thanks for joining us at Family Joy Blog Link-Up Party. It is SOOOOOO good! Thank you! Is this frosting just a cake type frosting or will it hold up well on sugar cookies? I would love to do this for Thanksgiving tomorrow. It would be delicious on sugar cookies. They would likely stick together if stacked at room temperature though. You could chill them to set the frosting or store them in a single layer. I hope you enjoy it! I highly suggest it! Thanks! Oh wow! That sounds amazing! We made cinnamon buttercream not to long ago and I thought that was heavenly but maple?! YUM! Pinned. Now I need to make some cinnamon buttercream! What kind of cake did you put it on?